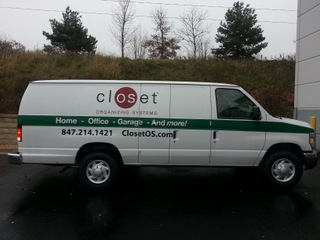 Closet Organizer Advertises with Vehicle Vinyl Lettering and Graphics! Sporting vehicle graphics for Chicago niche businesses is the perfect means of creating a need and then offering a solution for fulfilling it. But don’t take our word for it! Rather, take a page from the playbook of Closet Organizing Systems. With a main showroom located at 8N450 Tameling Court in Bartlett, this business serves Chicago as well as northern and central Illinois and also northwestern Indiana. Not surprisingly, the company vans put in a lot of miles when technicians are driving to customers’ homes, delivering residential or commercial closets, and then also installing them. When it came time to add vehicle vinyl lettering and graphics to the work vans, Closet Organizing Systems contacted Mark Your Space. We put a noticeable green stripe horizontally across the van. Above the stripe, we placed the company’s name and logo. Inside the stripe we identified that the company specializes not just in residential closet manufacture but also in commercial and even garage setups. Right below the stripe is the website address and the phone number. The back includes the pone number and website address as well as a window perf that features the company’s name and specialties. No matter on which side of the van the consumer walks, stands or drives, it is impossible to not take in the business’ information. Do you need vehicle vinyl lettering for Chicago area businesses vehicles? 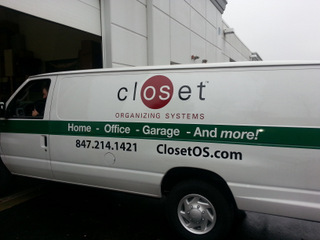 Whether you have one vehicle or a fleet of multiple vans, trucks or cars, we can help you stand out just like we did for Closet Organizing Systems. Round the clock marketing. The lettering stays in place and looks like new for about five years. This means that you get nonstop marketing action out of your vehicle whenever you drive or park on the street. Target your audience. A billboard is stationary. If no consumers walk past it, its message is not communicated. The same is not true for your vehicle graphics. Since you have the power to take your vehicles wherever you like, you are uniquely set up to target the consumers whom you are trying to reach. Inexpensive. Would you rather spend about $2,000 for professionally done extensive lettering or more than $130,000 to reach the same number of eyeballs via other advertising media? Better still, the majority of lettering and graphics application are a lot less expensive than two grand. It just depends on how much you want to have done. Boost name recognition. When the consumer sees your automobile roll down the road with its customized message, it is impossible to not take note of the company’s name and logo. Now, imagine if your have a fleet of vehicles rolling down the road. Consumers may not just see your advertising message once but multiple times. In fact, studies have proven that fleet vehicle marketing has the potential of increasing your company’s name recognition fifteen times more effectively than you can hope to accomplish with any other ad medium. Are you ready to create a need and then offer consumers a way to fill it? Contact us today for information on the perfect vehicle vinyl lettering and graphics package for your company cars. 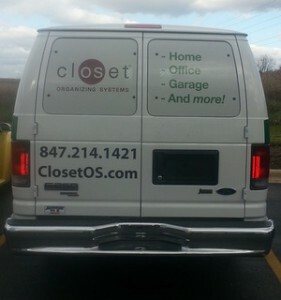 Title: Closet Organizing Systems Advertises with Vehicle Vinyl Lettering and Graphics in Chicago!